Habits. Everybody has them. Some are good; some can help make you more professional, punctual, and reliable. However, we all also have some bad habits that we should consider breaking. Some bad habits you may not even realize you have! So, what are some of the bad habits people often perform during the workday that they may or may not be aware of? Snacks are great, and are important to have in our diet. But, too much snacking can be detrimental to your health. Healthcare professionals and dietiti ans agree that you should limit the amount of snacks in your daily diet to two per day – mid-morning (approximately 2 hours after breakfast) and early-evening (after dinner, but no later than 8 p.m.). 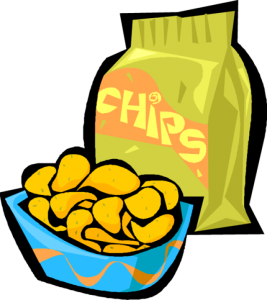 Additionally, the type of snacks you choose could be harmful to your health. If you’ve got a sweet tooth at 10 o’clock in the morning, skip the candy bar from the office vending machine and opt for a piece of fruit instead. Eating an apple with a piece of cheese or a pack of peanut butter crackers is a much healthier snack alternative, and will leave you feeling fuller longer than the Snicker’s bar. Whether you realize it or not, when you spend several hours sitting at your desk or in front of the computer, your bad slouching habit will eventually sneak up on you. Slouching is one of the worst habits that an office worker can have! It puts strain and pressure on areas of your back, neck, and shoulders that otherwise wouldn’t happen if you practice good posture. Too much slouching can also lead to low-back pain and other health conditions. The average worker drinks between 4 and 12 cups of coffee per day. As delicious as this warm drink is, too much can be harmful to your health. Drinking too much coffee can lead to many different health concerns, including stomach ulcers. Coffee contains and incredibly high amount of acid. This acid, over time, can slowly begin to erode the inner lining of your esophagus and stomach. Additionally, too much coffee can be harmful to your kidneys. Most healthcare professionals will tell you that a healthy amount of coffee is only one to two cups per day. If you notice that you’re drinking more than that, substitute the caffeine fix for something more nutritious like a glass of juice or water. Also consider changing your sleeping habits so that you don’t feel so sluggish throughout the day. Most people only have 30 minutes to an hour for lunch. This is the primary reason why people stop by McDonalds, Burger King, and Wendy’s for a quick drive-thru lunch. However, the high fat often associated with these fast food places will likely lead you to gaining more weight than you’d planned. Instead of choosing a fast food lunch, opt for packing a healthy, well-balanced lunch instead. This will not only allow you to take your full lunch break, but will keep you healthy and provide your brain and body with the vital nutrients it needs to function properly. A sandwich, carrot sticks, apple slices, granola bar, and a bottle of water will prove to be more satisfying in the long run than that Big Mac with cheese. The above list of bad habits are just the tip of the iceberg. There are literally hundreds of habits that people do that they may or may not be aware of. Here’s a few more examples, including ways to break them. Smoking – It’s well-known that smoking cigarettes can lead to COPD, lung cancer, as well as many other forms of cancer. If you’re a smoker and you want to break the habit, talk to your doctor. Your doctor may be able to prescribe various patches or pills to help you break the habit. Alternatively, you could also consider switching to electronic cigarettes. E-cigarettes allow you to control the amount of nicotine you use on a daily basis, so you can slow down at your own pace. And, they are typically healthier for those around you since you’re not exhaling “smoke”, but rather water vapor. Lifting Incorrectly – There is a right and wrong way to lift and move heavy objects. Incorrect lifting habits can lead to many problems with your lower back. Over-the-Counter Pain Pills – Working in a high stress or loud environment, headaches and migraines are common. However, taking too many pain pills can ultimately hurt your body more than the migraine themselves! Pain-killers have been known to be linked to the development of stomach ulcers and other stomach related conditions. If your migraines and headaches are due to stress, try practicing some stress relieving exercises. If they’re linked to loud noises, be sure to use protective ear muffs to help reduce the decibel level of the noises around you. Whether you realize it or not, bad habits seep into our everyday lives, regardless of whether we’re at work or at play. Being proactive and paying attention to these habits to try breaking them will not only make you feel good about accomplishing a goal, but it could also help improve your overall health.